ATTO Celerity™ Fibre Channel host bus adapters (HBAs) deliver the fastest data throughput (both MB/s and IOPs) available for today's most demanding storage environments, including physical and virtual datacenters, tape streaming and backup, rich content delivery, and server clustering. ATTO Celerity HBAs, featuring Multipath Director™ technology, are the only solution that allows direct connectivity to enterprise storage not just for servers, but also Windows®, Linux®, and macOS® workstations. They provide load balancing and path failover protection to improve overall Fibre Channel SAN efficiency with consistent uninterrupted access to your data. 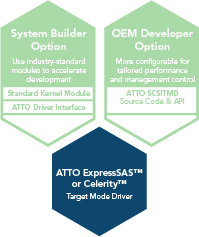 OEMs and system integrators can take advantage of ATTO Target Mode Software Development Kits (SDK) or industry standard driver options to create unique, branded storage and appliance solutions. Through a more tightly integrated driver, an ATTO Celerity Fibre Channel SDK provides integrators complete control, ownership and flexibility in creating custom capabilities to address specific product designs.